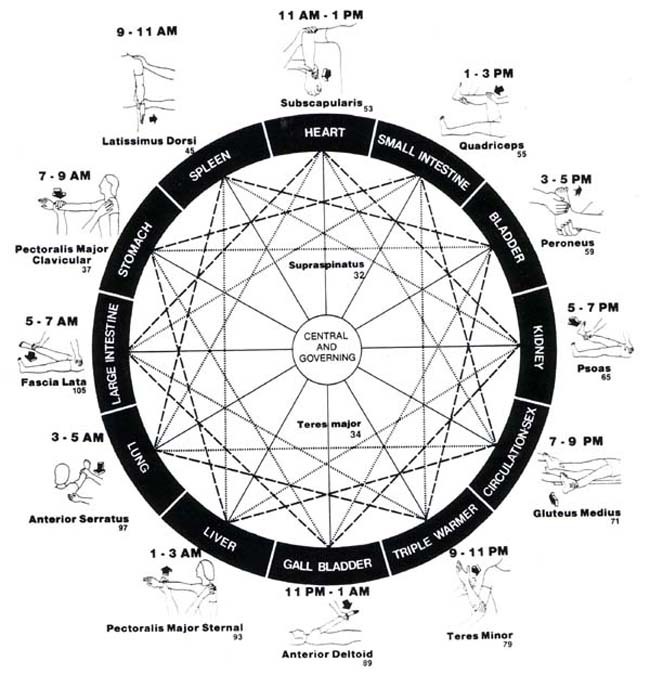 HJ: The meridian system in the human body is the basis for many different healing modalities. Three that immediately come to mind are acupressure, acupuncture and EFT (emotional freedom technique). What do they all have in common? They recognize the importance of the meridians in facilitating energy flow in the body and their ultimate effects on the health of the mind-body-spirit triad. While the entire map of the meridian system is complex, there a few main meridians that are important for everyone to know. Furthermore there are a few basic concepts elucidated below that will help one understand the relationship between time of day and dominance of the various meridians, which may, in certain cases, help explain why some of us experience various symptoms, moods, or feelings at various times of the day. In essence, knowing the meridian system helps one to know and understand themselves better in the process, which leads to greater health, happiness and unification of the mind-body-spirit triad. What is the secret to keeping up? Acupuncture vessels, or meridians, are located throughout the body. They contain a free-flowing, colorless, non-cellular liquid which may be partly actuated by the heart. These meridians have been measured and mapped by modern technological methods, electronically, thermaticly, and radio-actively. 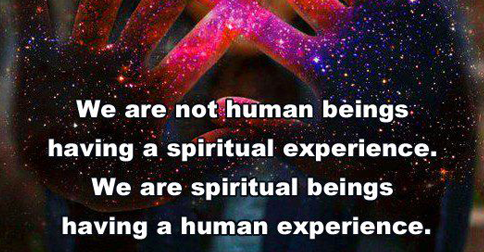 With practice, they can also be felt. There are specific acupuncture points along the meridians. These points are electro-magnetic in character and consist of small, oval cells called bonham corpuscles, which surround the capillaries in the skin, the blood vessels, and the organs throughout the body. There are some 500 points which are being used most frequently in a definite sequence, depending on the action desired. We name meridians by the life function with which they seem to associate. In most cases, this name is similar to the name of a gross organ we’re familiar with, yet muscle indication of energy blockage doesn’t mean there’s damage to the organ named. We cannot say that a weak muscle means a weak organ – we can only note that a portion of the meridian energy flow indicates blockage or constriction. The Chinese physician can detect imbalances in meridians by feeling the pulses, but this is a sensitive touch, and it may take 10 to 20 years to develop proficiency with it. Kinesiology uses muscle testing to detect these same imbalances, taking advantage of the body’s own wisdom to let us know what’s going on. As Yogis, we can correct imbalances by “being with” the imbalance. We create a pressure in the body system through asana that challenges our minds to make a peace with the moment. When we can come to a place of non-reaction while in the posture, we have made a shift in our internal and external relationship to a set of stresses once we have left the mat. Meridians are classified yin or yang on the basis of the direction in which they flow on the surface of the body. Meridians interconnect deep within the torso, but we work with the part that, is on the surface and is accessible to touch techniques. Yang energy flows from the sun, and yang meridians run from the fingers to the face or from the face to t he feet. Yin energy, from the earth, flows from the feet to the torso and from the torso along the inside (yinside) of the arms to the fingertips. Since the meridian flow is actually one continuous, unbroken flow, the energy flows in one definite direction, and from one meridian to another in a well determined order. Since there is no beginning or end to this flow, we represent the order of the meridians as a wheel. 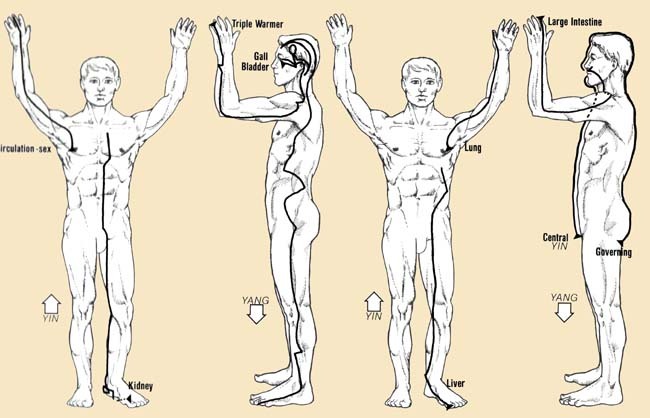 We go through this four-step process three times to cover the twelve major meridians. 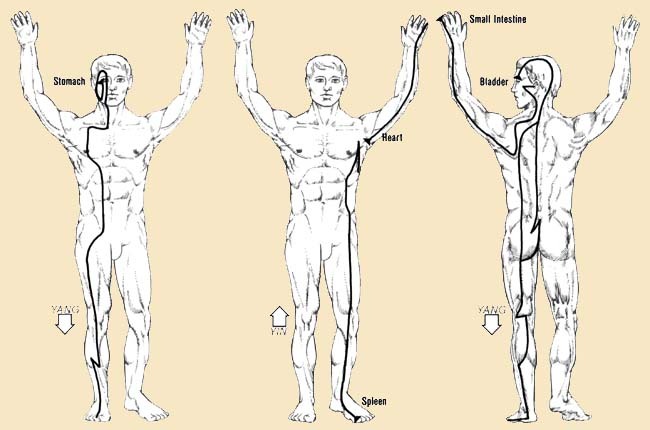 Running the meridians with the hand can be a quick energizing massage. Complete the massage by running the central and governing meridians, which run directly up the back and front of the body to the upper and lower lip. When this energy flow is unrestricted, the body harmonizes the flow to optimize body functioning. Sometimes, though, the life we lead and the abuses we heap upon our bodies cause stress, and sometimes the stress is so intense or so constant that, in effect, it “overloads” the circuit. The “circuit breaker” pops, and needs to be reset before energy can flow properly. Our indication of whether this has occurred is the muscle test. If a muscle tests weak, we know we have to go to certain spots on the body and press or hold to reset the body and restore proper flow. This restoration of flow is immediately indicated by a strengthening of the muscle.